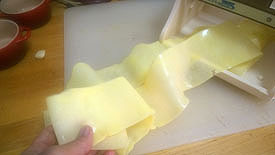 The mandoline is the simplest and most widely used of the vegetable slicers. It is a cooking utensil used for slicing and for cutting flat vegetable slices and juliennes. 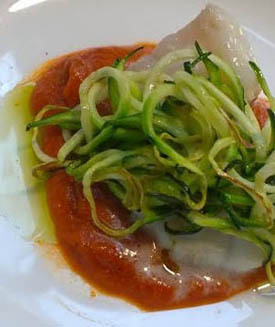 The advantage of a mandoline over slicing with a knife is that slices are uniform in thickness which is important for cooking foods as well as presentation. In addition slices can be made very thin and quickly with less effort than by using a knife. The mandoline consists of two parallel working surfaces, one of which can be adjusted in height. A food item is slid along the adjustable surface until it reaches a blade mounted on the fixed surface, slicing it and letting it fall. What are Spiral Vegetable Slicers or Spiralizers? The term spiralizer is rather new and many companies still use the term "turning slicer" The Spiralizer has become one of the new crazes for the home chef, considering it's ease of use, affordability and ability to produce countless new dishes -- especially light and healthy ones. Spiral vegetable slicers (also known as Spiralizers) are kitchen appliances used for cutting vegetables, such as zucchinis, potatoes, cucumbers, carrots, apples, and beetroots, into spirals. These spirals can be used as a pasta alternative. A firm vegetable is needed to start. The peeled vegetable is held in place with a clamp over the grinder, and as the vegetable disappears into the hold, the cook uses a hand crank to make to send the vegetable across different types of blades. The result is a pile of extra-long, gently curled ribbons or finely cut spaghetti. Interesting, but what makes this tool so great? 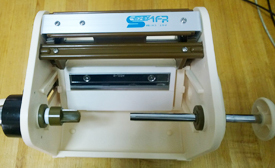 What is a Vegetable Sheeter? 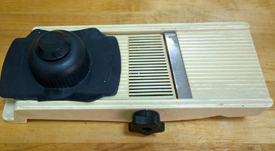 The Vegetable Sheeter (also called a turning slicer) shown below is used to cut flat sheets of vegetables and should not be confused with the turning slicer above which is also called a turning slicer by many. 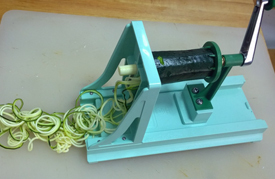 How can a Mandoline, Spiralizer or Vegetable Sheeter be used? 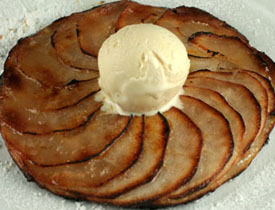 A mandoline can be used to create uniform slices of apples show above which are used to make a thin apple tart. Chef Daniel Boulud credits the Japanese Manoline (vegetable sheeter) for his inspiration in creating his Signature Dish Crisp Paupiette of Sea Bass which is a sea bass that is wrapped in thin potato slices and then seared on the stove top. By the time the poatoes are crisp the fish has cooked perfectly. Science of Chocolate --How is Chocolate Made? What are the drugs in Chocolate?